one of the game's most popular television sportscasters. split-screen play calling, quarterback "stop clock"
Just got this game. 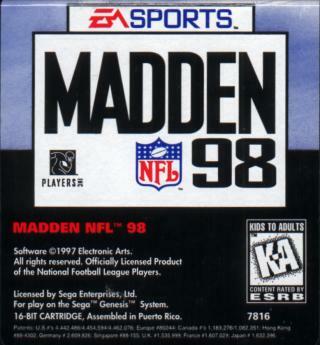 Was a huge fan of Madden \"93\"
Love all the great teams to play with. I think there are 40 in all not the eight that it says in the description above. Does anyone have the instuction Maunual with the player ratings in it for this game. Since it was a blockbuster Exclusuive I doubt many of the instruction Booklets survived. They were always at the back of the Instuction booklet or on a seperate fold out insert. Great two player action. If anyone has the info please leave me a message at this site. Or if you are associated with the site could you please post the ratings. I love beating the crap out of my brother in two player mode. Great game has better animation than 5, Great game if you like foot ball! (For a great football game try Mutan League Football) (Im not a big sport freak so I cant write to much). Well Thanks for reading this any way. Great game a bit of animation lacking, but no biggie! Great game if you like foot ball! (Im not a big sport freak so I cant write to much). Well Thanks for reading this any way. this is a cool football game.. it even has digital speech.. its hard to understand.. but its there! Its a great foot ball game! but not as good as my favorite Muntan League! This game is great downloaded it and it's really fun! I only owned one of the series ('92) but I can't count how many hours of fun we had with this cart! This is where the Genesis really shined--sports games. My friends and I could play this all day. Madden or Montana thats the question ! Its impossible to say which game is better ! Both are minimum a 9,0. When these games first came out I thought they were great, but last week when I took them out of storage and played them again for the first time in years, they are really starting to show their age. They are still fun, but I really have to recommend playing a newer version on a newer system - NFL 2k series on Dreamcast is awesome. Revolutionary!!! EA was king back then. I don't know how many hours I played those Madden games but it was alot. I liked 93 through 95. I remember the first time I played this game. At the house of my mother's friend who had a son. Needless to say, I loved it. I loved the gameplay. I loved how the players did flips and danced every touchdown. And I really got a kick out of the fact that when a player was injured, an ambulance would come out in the middle of the field, running over the other players in the process. (This actually started a video game violence controversery!) And while people thought each Madden was the same game with updated players, the games were different. Look at this game and look at Madden 98 for the Genesis. They are almost totally different games. A great series for the Genesis, the best of which is only second to Sega's NFL 94 for NFL games. 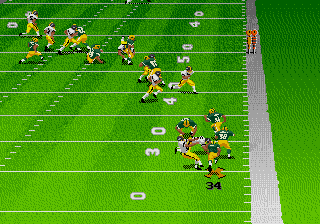 The original Madden was a major leap in videogame football. Nothing like it had really been seen before (even the earlier PC version was not like this). It sold me on the Genesis immediately. True 11-on-11 gameplay and a great combination of arcade action and real football strategy. I still recommend this one if you just want arcade football because it's Madden in it's purest form without all the extra stuff to worry about. 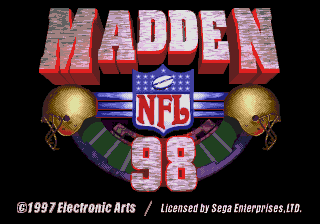 My favorite of the series for Genesis is Madden 96. It had arguably the best on field graphics that Madden saw on Genesis. It was the only version that included individual jersey numbers on the players themselves (all others only showed 88 except the player you were controlling). It had larger, better animated players than Madden 95 and a better field effect, too. I personally found the speed and balance to be better than previous versions, though I know that's my subjective opinion. Along with Madden 95, it also had XBand (modem) support though unfortunately the XBand service has long since expired. From there, I feel like the series started going downhill as EA shifted it's focus to the 32-bit generation. 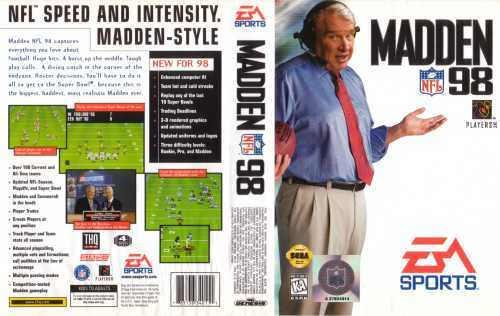 Madden 97/98 plays well and I liked the new custom league feature but I didn't feel as strongly about them as Madden 96. The only versions to truly avoid, IMO, are Madden 94 and 95. This is the game that shaped all modern football video games. Probably the most revolutionary sports game of all time. This one started it all.